We're getting jealous here -- with all the absolutely gorgeous green schools popping up around the world, we're wishing we could go back to school. 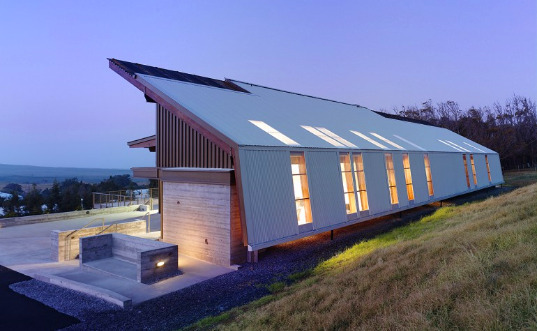 ArchDaily tells us that the Hawaii Preparatory Academy finished their new Energy Lab in January, which not only produces more power than it needs, but also serves to educate students on renewable energy and sustainability. It's also incredibly beautiful and set on the hills of the big island in Hawaii right outside of Waimea. Designed by Boston-based Flansburgh Architects, the Energy Lab is waiting for final confirmation of its LEED Platinum status as well as its Living Building Challenge certification. The living laboratory is powered by renewable energy, with solar panels on the roof and a couple small-scale wind turbines on the hill behind the school. The Energy Lab actually only uses 8% of the power it generates, while the rest is fed into the grid and goes to power the rest of the buildings at the academy, making it a zero plus facility. Remarkably energy-efficient by design, the lab also utilizes solar passive design principles, daylighting and natural ventilation to reduce its energy needs. Rainwater is collected from the large sloping roofs, and the building is able to capture and filter all of its own drinking and wastewater. Energy models were used to determine the fenestration and shape of the building during design to maximize daylighting. Cooling is provided via an experimental radiant cooling system that runs water through roof panels at night and stores chilled water for use during the day. Students who attend the Academy have the opportunity not only to study in a super sustainable building, but also learn from the technologies and systems inside. Direct connections to the outdoors are made available with outdoor teaching/learning areas, which provide inspiring views of the nearby Mauna Kea Volcano and the volcanic landscape creeping towards the ocean to the west. Being surrounded by such inspirational landscape as well as the super sustainable teaching facility is sure to provide our next generation with a great education in sustainability, encouraging them to make a difference. The design was by the architects but credit for the conceptual design goes to Dr. Bill Wiecking, who runs the Energy Lab and the computer lab. More details about the Energy Lab are http://www.hpa.edu/energylab and http://www.hpa.edu/energylab/about . Watch the video for more about what he envisions it to be and what it teaches. "We shape our buildings and our buildings shape us." Note also that if you are on Hawai'i you can go on a tour of the lab. 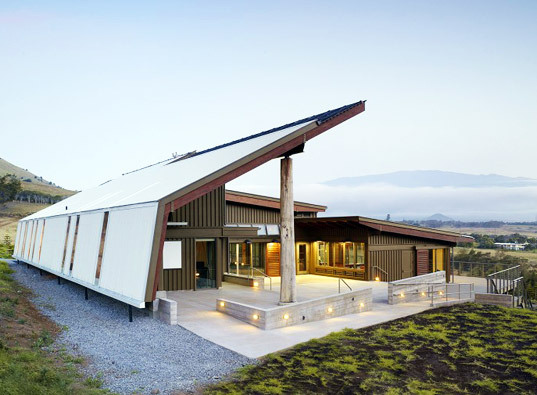 The super sustainable school serves as a renewable energy learning center and provides students with a new model for learning about sciences and sustainability. Completed in January 2010, the 6,100 sq ft building was blessed (as per Hawaii tradition) and opened for classes in April. The Energy Lab offers a different educational environment that not only provides an exceptional space for learning, but also teaches about sustainability through example. The building is completely powered by renewable energy. Solar panels cover the southern sloping roof, and small-scale wind turbines are located on the hill behind the building. More than enough solar and wind energy is provided for the Energy Lab, which only needs 8% of that power. The rest is fed into the grid and supplies power for the rest of academy. 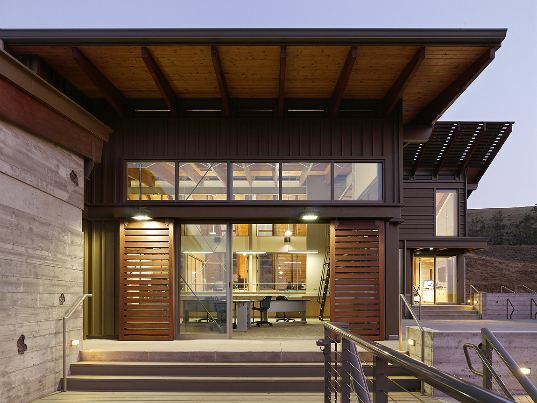 Energy modeling was performed during the design stages in order to maximize daylighting and natural ventilation. 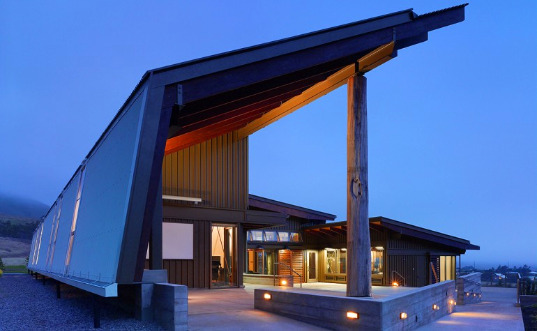 The design for the building was based on a traditional triple-roofed Polynesian design -- a steep sloping roof in the back, a lower sloping roof in the middle, then a covered lanai front. The theory is that all the hot air rises up to the highest point in the roof and escapes out. Shading for the buildings with large overhangs and sliding screens protects the interior from the sun and inclement weather. Students have a chance to study and research renewable energy systems as well as other sustainable technologies. Hawaii Preparatory Academy's Energy Lab also serves as a conference facility and advanced video conferencing facility. The Energy Lab also includes some advanced teaching techniques that transform the traditional model of teacher in front and students behind. Everyone faces in, no one is in the back or front. Solar panels on the roof provide all of the energy needed for the building, and solar hot water panels produce hot water for the bathrooms and labs. Each room has natural daylighting and views of the spectacular surroundings outside.